Oh, I’ve missed this! Before children came along, and the realization that I couldn’t consume dairy products had materialized, the ultimate self-indulgence for me was to spend an evening on my own, poring over a jigsaw puzzle, and drinking Bailey’s Irish Cream. A couple of years ago, friends brought a bottle over as part of a dinner party, and all I could do was look sadly at it. Not so any more. 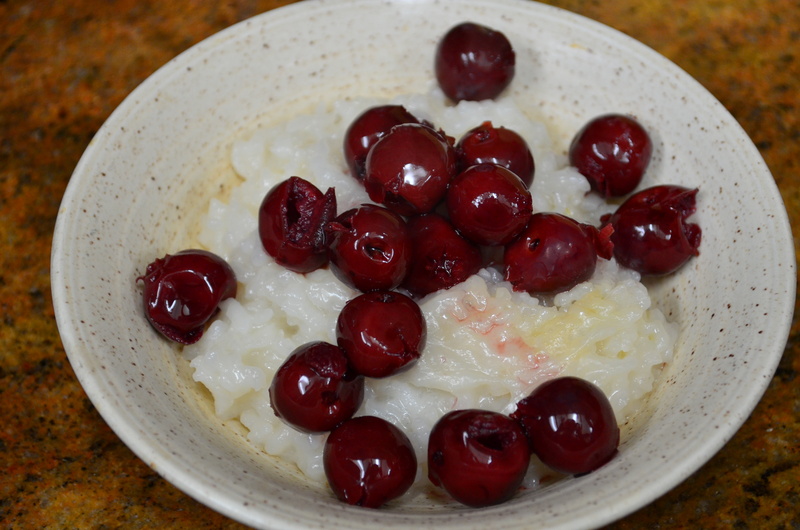 This version is thick and creamy, festive and comforting; just right for the on-coming holiday season. 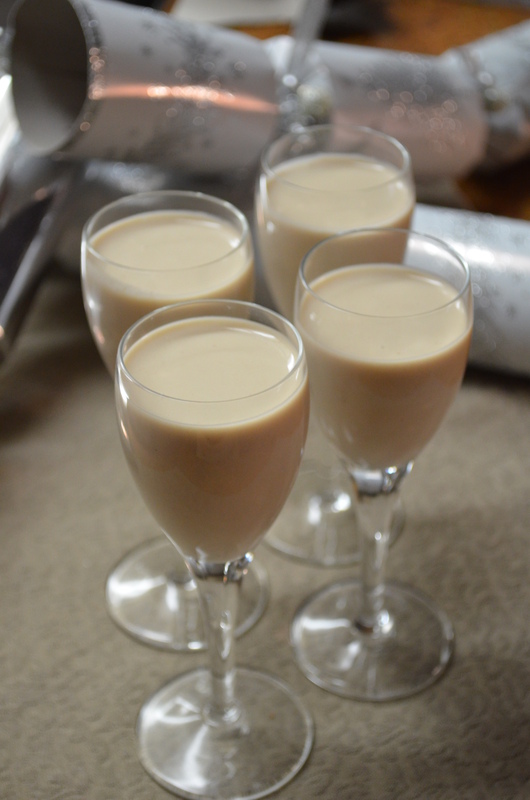 Note that this mixture thickens as it sits, and you should either drink it immediately (poured over ice-cubes to chill), or expect to have to adjust the consistency with water or brandy (your choice). Put all ingredients into a blender (preferably high speed), and blend until smooth. Chill in the fridge until required. Adjust consistency with water/brandy if required. Serve in sherry glasses, or in a tumbler on the rocks. This creamy pesto sauce is remarkably rich for being vegan, and almost all the fat comes from the pinenuts (there’s no added oil, as there is in regular pesto). This is much better for my poor tummy that can’t cope with high fat pesto. It’s also very quick to make, so I start making mine after putting the pasta water on to boil. 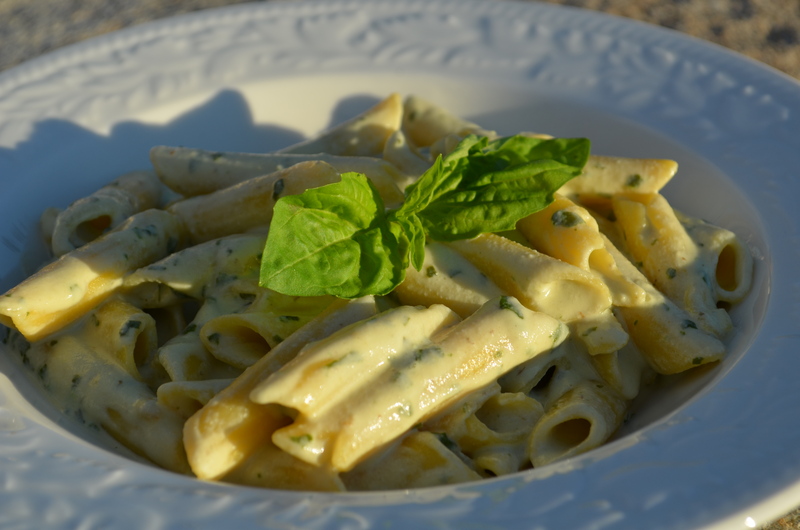 The first time I made this version of the sauce, I blended the basil along with the other ingredients, and although it tasted good, it was a very vivid green, surprising enough for Halloween! I think the little flecks of basil look good in the sauce, which is why I now add the basil after the other ingredients have been thoroughly blended. As a last note: don’t try using the basil stems in this dish. I was just a little too pleased with my new Vitamix a few months ago, and tried making pesto using stems and all. It didn’t work. I couldn’t get the stems to blend up smoothly, and ended up throwing the whole lot on the compost heap. I was not a happy bunny! This amount of sauce generously coats 8 oz of dried GF pasta. If you’re using this sauce for pasta, put the pasta on to boil, first. Blend all ingredients (except basil) together with 1 cup of water in a blender until completely smooth. Add the basil leaves, and blend until the sauce is pale green with flecks of basil. 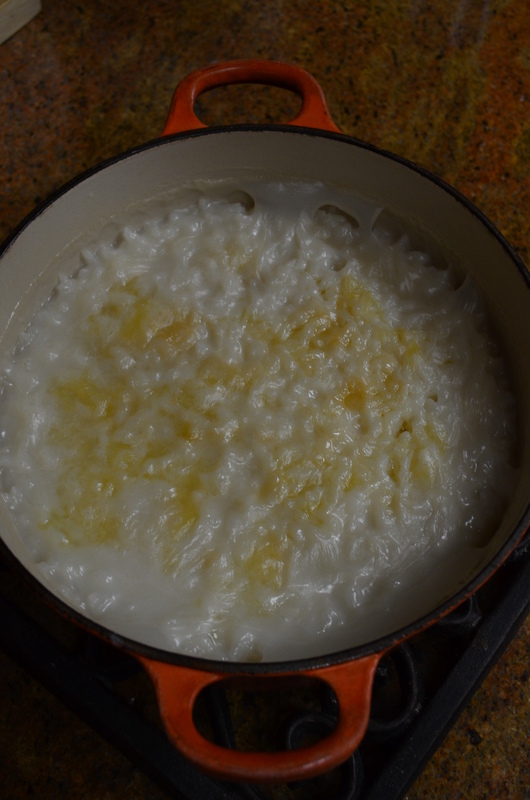 Transfer to a saucepan (with cooked, drained, pasta, if using), and heat (stirring frequently) until thickened (~1 minute, if tossing with hot pasta). Variation: Dice 2 medium sized tomatoes, and stir them into the sauce when thickening it. The fresh tomatoes are a nice counterpoint to the rich sauce. I’ve got to be kidding, right? Cabbage pie! It just so happens that I love this pie filling. It is good in a pastry cased pie (with accompanying chickpea or cashew gravy) or on its own as a pilaf. I’ve made it numerous times, just not recently, and not with GF pastry. I had a bit of a brainwave today, and adjusted my pastry recipe (now reflected on the updated page). This quantity makes enough for a single 8″ pie which feeds 4-6 folks. 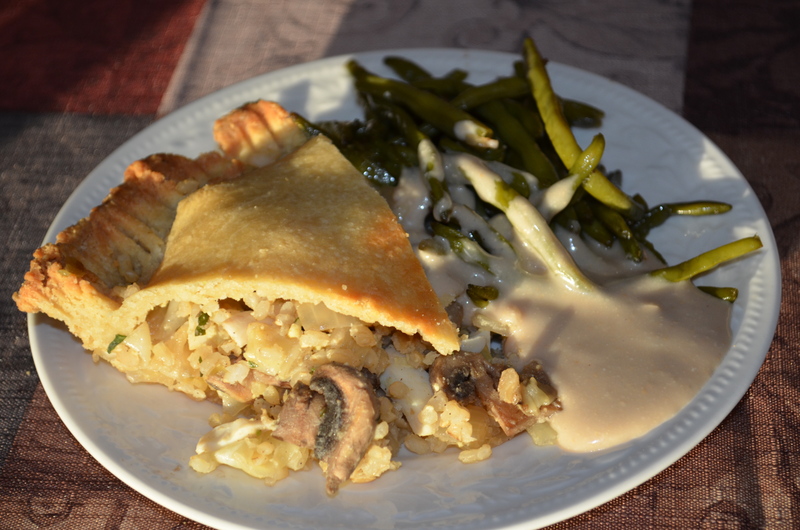 Gluten free cabbage pie with an almond pastry, garlicky green beans, and cashew gravy. 1/2 lb pastry – I like Tender Shortcrust Pastry made with almonds. In a large frying pan, heat 2 tsps of the margarine, and fry the onion and cabbage until the onion is translucent. Tip this into a mixing bowl. Now heat the remainder of the margarine in the frying pan, and cook the mushrooms on medium high heat. Sprinkle the mushrooms with 1/4 tsp salt to encourage them to release their juices, and when they do, add the garlic. Cook until the mushroom juices have evaporated. Do not allow the garlic to burn. Tip the mushrooms and garlic into the bowl with the cabbage. Stir in all other filling ingredients. Fill with the filling; roll out the smaller part of the pastry and use it to top the pie, crimping the edges together. Brush the surface with soy milk. Place in the middle of the oven (lightly covered with parchment to prevent over browning), and cook for 30-35 minutes at 380F.